Meryl Streep sings and struts her way through this easygoing BUT tragically mediocre melodrama. 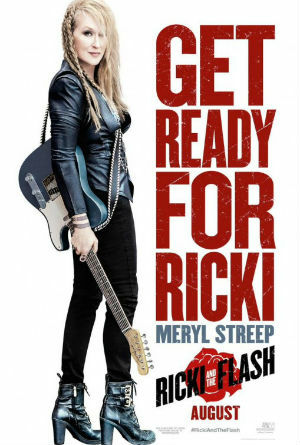 A musician (Streep) who gave up everything for her dream of rock-and-roll stardom returns home, looking to make things right with her family. Penned by Diablo Cody. A somewhat mixed reaction for me. At her best, Juno. Her worst? Jennifer’s Body. This effort luckily fares somewhere in between. We join Ricki as she performs at her local venue. A battered up pub with her regulars; half a dozen bar flies. I am a huge fan of the Streep. You know that with any film she will give 100%. It was a perfect showcase to see Streep do her best Stevie Nix impression. Anyone who has seen Mamma Mia and Into The Woods will know that she has a cracking voice. The songs that were written for the film weren’t that bad. It was easygoing and chugged along. BUT things took a more interesting turn as Ricki has to return home to tend to her daughter (real life daughter Mamie Gummer) who is reeling from a bad divorce. It was great seeing Streep act with her own daughter. Gummer gave as good as she got. As soon as she made her introduction and stormed into the room with her messy hair and dressing gown, I knew Streep had met her match. The fractious relationship between Ricki and Julie made for good viewing as the pair tried to reconcile their differences. It may have been 33 years since Sophie’s Choice but Kevin Kline and Streep finally reunite once again. They worked well together and Kline played the role of the ex-husband Pete brilliantly. Desperate for the family to be together again. If anything, I was a little disappointed that he wasn’t in it enough. And that was the main problem for me. There wasn’t enough drama. It didn’t kick off as much as I had hoped and was resolved far too quickly. A heated reunion at a restaurant was a perfect boiling point for Ricki’s sons to vent their anger at their mother who chose fame over family. Audra McDonald’s Maureen and Streep’s Ricki sparred brilliantly together. It made for a compelling scene as we finally delve a little more into Ricki’s past. I just wish more was made of it. A few passing comments and snipey remarks wasn’t enough. You certainly felt for Ricki but you could also understand Maureen’s frustration after taking over as mum for all those years. The problem was that after the hour marker, the film fizzed out. All the interesting family drama was put on the back burner and we were left moping over a silly little love subplot with Rick Springfield’s Greg. Springfield played the love interest well enough. He was a likeable character BUT it was obvious that the pair would get together. To be honest from their on-stage banter and flirty exchanges, I thought they already were. There were still some good scenes as Ricki desperately tries to hide her feelings and question why Greg would love someone like her. Awww. BUT it shied away from the real story for me. And yes, I did clock Diablo Cody as one of the bar regulars. Ben Platt (Ol’ Benji from Pitch Perfect) still managed to annoy the hell out of me. Even in a small bartender role. The closing quarter was far too schmaltzy for my liking. Don’t get me wrong, there were some nice moments as the family seem to accept her and she suddenly receives a wedding invitation. BUT there was a suggestion that Pete still had feelings for Ricki which was never really explored or bothered with. It ended far too quickly and was dreadfully corny and OTT. A good old song and dance to make up for 35 years of neglect and anger? Okay. Obviously, Ricki is a singer and that was all she could offer. BUT come on! Streep may have nailed Bruce Springsteen’s ‘My Love Will Not Let You Down’ BUT, no disrespect to The Boss, I don’t think everyone would be raving to it at a wedding. Predictable and a little too hammy for me. Streep was superb and the cast did their best. If it wasn’t for them, this could have been a very dull affair.